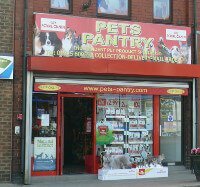 Pets Pantry - Warrington has been in business for over thirty eight years. The business has been built on excellent customer service and has grown organically from a small corner shop to a large two storey store and warehouse. The business is run by a husband and wife team that collectively have over 70 years experience within the specialist pet trade. We stock a vast selection of natural and hypo-allergenic pet foods and treats as we believe the fundamentals of good health comes from your pet’s diet. Our enviable range of over 10,000 quality pet products covers all companion pet needs; many from British manufacturers. With our website we aim to give our online customers the same service enjoyed by our face to face customers. We like to think we have kept the traditional pet shop feel to our website with our freshly packed pet foods and treats plus our unique product ranges.